The nations of the world remain silent about the siege which started in 2006 and about the indescribable suffering of the people in Gaza. The nations are complicit in their silence. They do not speak and there is no end. and generally within the society. for my children and I'm very happy.' 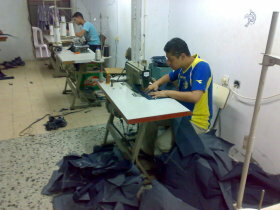 Every worker had 45 -50 NIS / day and that is very good in these days. The quality of garments were excellent, and all the recipients thanked the D&D and the British people for this good help. We hope to continue in implementing new projects and employ new workers. ME. Please tell me how things are, including the 'political' scene briefly. Half of the Gaza people cannot pass out through Rafah, even for Makka because they are 'Hamas'! Also, on the other side, in the West Bank, there are new settlements, betrayal and plots. ME 6 November 2010 Nihad does not mention that the people and property, including farmland, are being attacked daily. There are steady reports of wounding and of killing. A previous message reports the deliberate shooting of children in their legs at Beit Hanoun whilst they collect ballast for building for a few shekels. Qassam rockets are fired sporadically and in response to 'incursions'. Please see the trailer and publicise the film.